Gravitational lenses are at the forefront of current research in cosmology and astrophysics. In astrophysics, they have been used to uncover the structure of massive galaxies, to study how supermassive black holes relate to their host galaxies, and to gain insight into quasar accretion disks as well as their black hole spin. In cosmology, they have contributed to measuring the distribution of dark matter around galaxies and the expansion history of the universe. Since the discovery of the first gravitationally lensed quasar in 1979, gravitational lenses have become powerful probes of astrophysics and cosmology. Because they require a very specific configuration between a background quasar (a bright, distant object powered by a supermassive black hole) and a foreground lensing galaxy, quadruply lensed quasars are especially rare. In fact, to date there are only about three-dozen such objects known over the entire sky. Response System (Pan-STARRS) using a combination of all-sky survey data from the USNO Robotic Astrometric Telescope (URAT) and the Wide-field Infrared Survey Explorer (WISE). USNO graduate student George Nelson, who was performing a URAT variability study of the brightest quasars identified by USNO astronomers using WISE colors, discovered the lens while investigating the optical properties of a bright quasar sample. A paper confirming the discovery by a separate team of astronomers using the Keck Cosmic Web Imager has been submitted to the Astrophysical Journal Letters. A preprint of this paper may be found at arxiv.org/abs/1707.05873. Gravitational lenses are a manifestation of gravity’s ability to bend light, which was predicted by Einstein’s general theory of relativity in 1915. Since then many experiments have been carried out to test this theory starting with Sir Arthur Eddington’s observations of light bending during a solar eclipse in 1919. When a galaxy acts as a gravitational lens to a background quasar, the lensed quasar appears as dual or quadruple images, depending on the relative location of the lens and the source. Lenses are rare because they require that the galaxy and the quasar be located within a few arcseconds of each other on the sky. Future radio, X-ray, Hubble Space Telescope and adaptive optics imaging, as well as spectroscopic studies, are already planned to further the study of this lens and to contribute to fundamental research. 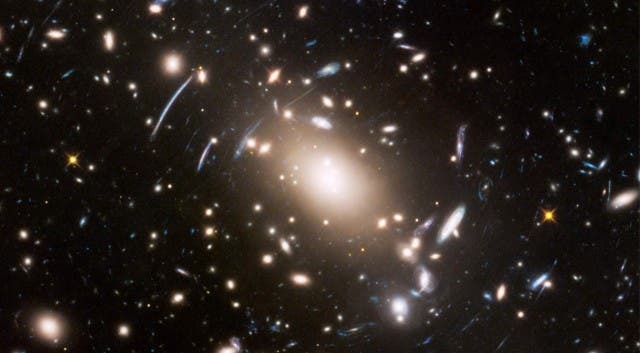 The field of galaxies in the center of the Hubble image at the top of the page is known as Abell S1063, which is about 4 billion light years away. The target of the Frontier Fields project isn’t actually the galaxy cluster, but what’s behind it. The objects behind Abell S1063 are what astronomers are truly interested in. Those galaxies are from the very early universe, just a billion or so years after the big bang.